This week’s reading from Parashat Bereshit (Bereshit / Genesis 1:1-6:8) contains some of the most significant actions of God, which set the stage for all of Scripture. More specifically, we are told the first thing the Lord does in His creation, is to separate the light from the darkness. What is the significance of the Lord beginning His creative process by separating the light from the darkness? Is it possible, in this description of the creation events, the Lord God is laying the foundation for not only the definition of a day, but to say that the beginning of His ways is to make a distinction between light and darkness, as an illustration for the beginning of His work in our lives to make a distinction between righteousness and unrighteousness? In the creation account in Bereshit / Genesis 1, the Lord describes the separating between the light and the darkness, as day and night, and that it is very good. He specifically calls the light “good,” but not state the darkness is good. The following verses adds additional context to the separation process. In Bereshit / Genesis 1:6-8, the Lord continues His separation process of creation, by separating water from water. Note how the Scriptures speak of the waters from above and the waters below. This may be an illustration on the water vapor found in the sky as opposed to the liquid water on the earth. The Scriptures again are setting the stage by describing the power of God, His ability to make a division and distinction between the things above from the things below. In Parashat Haazinu, Moshe described Heaven and Earth as bearing witness, and to let His testimony be as the rain which comes from above. The illustration was as the Torah is from since before the creation, being with God in the beginning, the Lord sends His Torah from Heaven to Earth, His instructions in righteousness comes from above. The Lord separates the heavens from the earth, and there is light and darkness, morning and evening. Notice how all of these things are connected, and how the creation account is drawing these things into context of one another. In addition, based upon these Scriptures (Bereshit / Genesis 1:14-19), another key distinction the Lord is making is that the creation of light did not extinguish all darkness in all places, but rather that there were places for both light and darkness, just as day does not annihilate or do away with the night. Note how in the heavens, the Lord placed the stars to be sources of life within the darkness. In a similar manner, He places us in the midst of this present age to be a light for truth, righteousness, and justice. The significance of Parashat Bereshit, and of these observations is that we learn of the creation of the world, the creation of man and woman, the fall of man into sin through disobedience to the command of the Lord, and the mercy and grace of God to forgive man of his sins. The importance of these introductory chapters to all of Scripture, is that the Lord is making a distinction between light and darkness, which has its parallel to the beginning of God’s ways, and the differences between good and evil, righteousness and unrighteousness. Based upon these first few verses, the Lord separating the light from the darkness, a great amount of doctrine, theology, and literatures have been developed over the centuries. The separation process described in the creation account cannot be understated. This week, let’s study what the Lord is trying to tell us regarding the beginning of His works, to separate the light from the dark, and that “It is good,” and how this is related to righteousness and unrighteousness. Studying the first chapter of Parashat Bereshit, the one thing that we may observe from the creation account is that the Lord separated the light from the darkness, the Lord separated the expanse of waters, and lights were placed within the expanse of the heavens in the midst of the darkness to be signs for seasons, for days, months, and years. If we draw a parallel to the light and darkness and to righteousness and unrighteousness, the Lord calls and places us within the darkness of this world to shine forth His truth, to speak into the darkness, to the unrighteous of the righteousness of God and of His love and mercy. What a wonderful illustration the Lord is drawing here in the context of the creation account with regard to the calling Lord has for His people, to live, to love, and to reach out to the lost. The rabbis have much to say concerning the creation account. The following are a couple discussions from Shelah, Terumah, Torah Ohr 51 and Midrash Rabbah Bereishit, Parashat 2, Part 5. Shelah: Prior to the creation of the universe there existed only G’d and His name in total and absolute secrecy, a concept which I have explained elsewhere at length. Once it had become His will to bring into existence a universe, the Torah firsts speaks about בראשית ברא אלוקים (Bereshit / Genesis 1:1), and afterwards the Torah refers to: ביום עשות ה’ אלוקים (Bereshit / Genesis 2:4). This shows that the four-lettered name of G’d remained secret and only the name אל-הים which has the same numerical value as the word for nature, i.e. הטבע (86), was revealed. I have already mentioned that the creation of the universe proved that G’d existed before the universe. G’d’s existence is manifest only through His activities. The essence of G’d, by definition, remains hidden. Anything revealed must by definition have previously been concealed. The very name of G’d, which alludes to היה, הוה ויהיה, “something that was, is, and will forever be,” is the cause of any existence and enables all that exists to continue doing so. This is why the verse quoted from Bereshit / Genesis 2:4 does not merely describe G’d as having created the universe in the past, עשה, but also as an ongoing process, עשות. In Shelah Torah Ohr on Parashat Terumah, the commentary points out that the only one that existed before the creation of the universe was God and His name in absolute secrecy. 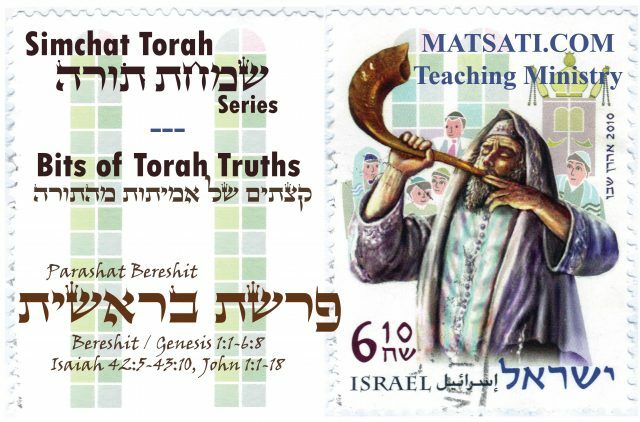 The commentary continues saying, “the Torah firsts speaks” saying בראשית ברא אלוקים “(Bereshit / Genesis 1:1), and afterwards the Torah refers to:” ביום עשות ה’ אלוקים “(Bereshit / Genesis 2:4)” referring to the work of God and His name, that before the creation, His name was secret, and after the creation, the Lord and His name are revealed in His works (in His activities). The interpretation is that the Lord is the one who enables all to exist and to continue to exist where Bereshit / Genesis 2:4 indicates the creation process is an ongoing process. So the idea here is the Lord is revealed in His activities, and that His creating and sustaining work is an ongoing process. This sustaining process may be described as His separating the light from the darkness which is paralleled to righteousness and unrighteousness, which is also an ongoing process. In addition, remember the rabbis say that the world exists as a result of the Tzadikim Nistarim (צַדִיקִים נִסתָּרים, “hidden righteous ones”) or the Lamed Vav Tzadikim (ל”ו צַדִיקִים, “the 36 righteous ones”). The point is that the Lord is continuing his creative process of separating the light from the darkness even to this day. If the Lord was not continuing this aspect of His creative process the world would end. Based upon this observable world, we know that the Lord’s process of separation is continuing today in His Messiah Yeshua in which we find the fulfillment of His promises to our Fathers, Abraham, Isaac, and Jacob, in each person that He calls out of the darkness and into the light, (1 Peter 2:9) or from unrighteousness into righteousness. Midrash Rabbah Parashat 2, Part 5 has the following to say concerning the creation account. Notice what Midrash Rabbah Bereshit states, “from the beginning of the creation of the world the Holy One saw the actions of the righteous and the actions of the wicked.” The rabbis also recognize the significance of the Lord separating the light from the darkness as a reference to the need to separate the righteous from the unrighteous. The point they make is that the Lord saw the differences between the two and thus began his creation by the separation of the two. Note the differences when comparing the righteous from the unrighteous, there is no congruency. Righteousness and unrighteousness are contradictory terms and both cannot exist together, one will be at war with the other if they are both kept in the same vessel. The separation process is bringing order into one’s life, the same that was needed in the beginning. The rabbis describe the actions of the wicked as “empty,” whereas the actions of the righteous are called “let there be light.” If we seriously examine our ways today, can our actions and thoughts be described as the light or righteousness of God? Do you or have you seen a difference in your life, as a result of your faith in the Messiah, something that comes from within that is not of yourself but that which the Lord is working, doing, or changing? The rabbis parallel the actions of the righteous to the building of the Temple, and the actions of the wicked to the destruction of the Temple. The rabbis conclude the midrash saying, “Arise, shine, for your light has come, and the glory of the Lord has shone upon you. For behold, darkness shall cover the earth, and a gross darkness the kingdoms, and the Lord shall shine upon you, and His glory shall appear over you.” The separation of the light from the darkness is paralleled to the glory of the Lord shining upon His people (the light) as opposed to the kingdoms of the earth that dwell in the darkness (unrighteousness). So, again, is it possible, in this description of the creation events, the Lord God is laying the foundation for not only the definition of a day, but to say that the beginning of God’s ways is to make a distinction between light and darkness as an illustration for the beginning of His work in our lives to distinguish between righteousness and unrighteousness? From when you placed your faith in Yeshua the Messiah, are you seeing a progression towards righteousness in your life? Based upon Parashat Haazinu, the Torah of Moses (and all of Scripture) was given to us in a form we can understand and comprehend. In the Torah we are told that God’s instruction descended from heaven at Sinai and took upon himself language that we might listen, understand, and obey. The Lord gave commands and statutes so that we would be able to speak His word and apply His word to our lives. When we walk in God’s ways, we allow God’s Word to be clothed in human flesh. That instruction which was in heaven, in the beginning with God, descended from heaven to earth like rain. The rain waters every living thing on this earth, and water, an essential element for life, is a part every living thing. Note how the instruction of God is paralleled to rain, and that we live God’s word because it is a nourishment for our souls. The main source for the instruction in righteousness is from the Torah of God. In the opening verses to Tehillim / Psalms 78, Asaph states , א מַשְֹכִּיל לְאָסָף הַאֲזִינָה עַמִּי תּוֹרָתִי הַטּוּ אָזְנְכֶם לְאִמְרֵי-פִי: A Maskil of Asaph. 78:1 Listen, O my people, to my instruction; Incline your ears to the words of my mouth. (NASB) he says “my Torah,” (תּוֹרָתִי) and that we are to listen, to incline the ears, to the words of his mouth. The word Torah (תורה) is derived from the root word לירות or yareh (ירה) meaning as a verb “to shoot, fire (arms), cast, throw (ancient).” The verb is used having the meaning to shoot an arrow and hitting the mark. That mark was the object being aimed at hitting, an therefore the word Torah has the meaning of hitting the mark. In the books of Moshe, the target is truth, God’s truth, and how one is to understand the differences between truth and falsehood, how we are to draw near to the Lord, and how to relate to the Lord. Based upon the derived meaning of the word Torah (תורה), the aim or goal of Torah is to teach us the truth about the Lord God in heaven, the creator of the universe. With this sense on the word Torah (תורה), the meaning of Torah is “direction, teaching, instruction, or doctrine.” In addition, with the knowledge that the Torah is “God’s instructions to His people,” we may concluded that the typical translation of this word as law is not quite accurate. Note how the Aramaic Targum translates the Psalm saying, א שכלא דרוח קודשא על ידוי דאסף אצית עמי אוריתי אצלון אודניכון למימרי פומי׃ 78:1 A teaching of the Holy Spirit, composed by Asaph. Hear, O my people, my Torah; incline your ears to the utterances of my mouth. (EMC) The rabbis translate the words of Asaph as being inspired by the Holy Spirit, and as the instruction or teaching of Asaph that is inspired by the Lord God Himself. The Targum (the rabbis) is in agreement with this interpretation of the word Torah (תורה) meaning the instruction of God. While studying the Septuagint, a statistical analysis of the Greek text reveals that the most common way the word Torah (תורה) is rendered is by the Greek words nomos (νόμος) or nomo. The Greek text uses the word nomos (νόμος) in a variety of ways, one of which is law, however nomos is not limited in its translation to mean “law.” For example in Mishley / Proverbs 1:8 שְׁמַע בְּנִי מוּסַר אָבִיךָ וְאַל־תִּטֹּשׁ תֹּורַת אִמֶּֽךָ׃ 1:8 Listen, my son, to your father’s instruction and do not forsake your mother’s teaching. (NIV) and the Septuagint translation, ἄκουε υἱέ παιδείαν πατρός σου καὶ μὴ ἀπώσῃ θεσμοὺς μητρός σου, the rabbis translate the word Torah as thesmous θεσμοὺς meaning “instruction.” In a similar way, within the Apostolic Writings, the authors render the Hebrew word Torah (תורה) using the word nomos (νόμος) or nomo (ὑμῶν), where in some instances, it is more appropriate to translate nomos as God’s “teaching or instruction” rather than “law.” There are two Hebrew words that are derived from the same root as Torah, (i) moreh (מורה) and (ii) horeh (הורה). A moreh is one who imparts instruction to his/her students, and a horeh is a reference to a parent who teaches and instructs the his or her child. As a result these things, the word Torah takes on a greater meaning that simply “law.” In addition, Judaism uses the word Torah in a very broad sense. For example, sometimes the word Torah is used to describe the Talmud. In other instances, the Torah may be a reference to the Oral Torah, the Mishnah, etc. According to the Sages, the Oral Torah was communicated to Moshe on the mountain of Sinai, and Moshe wrote down the written Torah, the Scriptures. The oral Torah was transmitted orally through the generations until Rabbi Yehudah HaNasi authorized for the oral Torah to be written down due to the destruction of the second Temple in Jerusalem. The writing of the oral Torah is called the Mishnah. The Mishnah was completed around approximately 200 CE. Following the writing of the Mishnah, the sages began to write commentaries on the Mishnah and the Torah in the MT, and these commentaries are called the Gemara. The Gemara was combined with the Mishnah into one work called the Talmud. There are two Talmuds, one produced in Israel (Jerusalem Talmud) and the other produced in Babylonia (Babylonian Talmud). The Jerusalem Talmud was completed in approximately the year 400 CE and the Babylonian Talmud was completed roughly around 500 CE. Today, Judaism for the most part (the Orthodox) consider the Babylonian Talmud to be the more authoritative of the two Talmuds. As a result of the communicating of the Sages discussions in written form (commentary), the writing of the Mishnah, and Judaism’s use of the Talmud for hundreds of years, the Talmud is considered to be the Oral Torah, the same Oral Torah that was revealed to Moses on Mount Sinai and, therefore, carries great authority. As a result of these things, it is important to study and to know the Mishnah and the Talmud. As we have seen in this study thus far, learning about the interpretations of the rabbis may help to interpret and understand many passages in the Scriptures, their application to our lives, and for understanding the Apostolic Writings. The important point to remember while studying the Mishnah, the Talmud, and the rabbis, is to understand that these are interpretations of the Scriptures, and interpretations are always open for debate on their authoritative nature. The written Scriptures however should hold a greater spiritual authority over our lives, the written Word of God, the Tanach and the Apostolic Writings.